As the spring ushers in warm, sunnier days, nature blushes in a heavenly pinkish glow. Yes, we’re talking about cherry blossom. Springtime marks the blooming of cherry flowers and when it reaches mankai (full bloom), vibrant pink and white hues fill the air. We’ve cherry-picked (pun intended!) the best places around the world to see cherry blossom if you fancy seeing this spring spectacle for yourself. But remember, the flowers bloom just for a week or two, so you'll need to time your visit accurately – our cheap last minute holidays ensure you’ll be soaking in the views in no time! What arrived as a gift from Japan has become the US capital’s much-loved spring attraction. The 3,000-plus cherry trees at Washington DC’s Tidal Basin in West Potomac Park paint the area with all the shades of pink and white you can possibly imagine. Walk along the 2.1-mile-long circular trail of the Tidal Basin to admire the cotton candy-coloured blooms. Cherry blossom in Washington DC isn’t just an annual floral blooming, but one of the nation’s biggest springtime celebration. The National Cherry Blossom Festival celebrates the blooming season with a number of events, including fireworks, kite festival and parade. The festival attracts quite a footfall and the area teems with visitors, so your best chance to see the blossoms is at dawn. But if you can’t make it in time, watch the cotton candy-coloured Tidal Basin through the Bloom Cam set up by National Park Service. 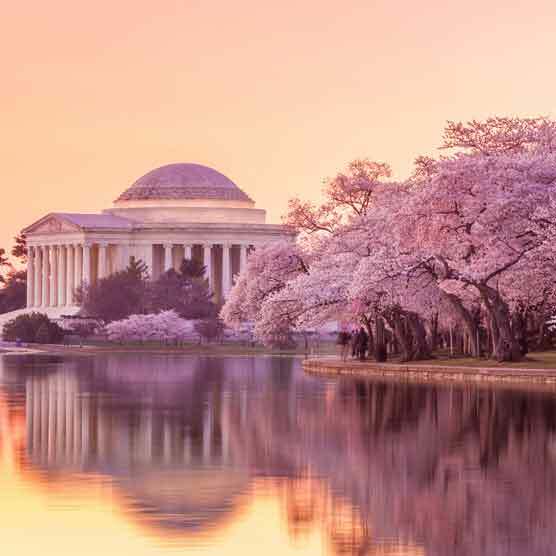 When to visit: The month-long National Cherry Blossom Festival coincides with the blooming season, which starts from mid-March and continues till early to mid-April. For the perfect 'cherry on top': Take part in the Cherry Picks program and explore the city’s participating restaurants that prepare a spring-inspired creative menu. Popularly known as hanami, the cherry blossom festival is one of the best times to plan a trip to Japan. Of all the places to witness the blooming sakura (cherry flowers), nothing beats the magic of Tokyo. The 700-metre-long Chidorigafuchi-Ryokudo Walkway along the moat of the Imperial Palace is one of the city’s best venues to view Japanese cherry blossom. You can also rent boats to admire the pink blooms from the water. Another go-to spot is Ueno Park, one of Japan’s oldest and most loved hanami destinations. Those who’ve missed the main season can head to Shinjuku Gyoen that’s dotted with around 65 species of late blooming cherry trees. Some other prominent hanami spots in Tokyo include Yoyogi Park, Asukayama Park, Koishikawa Botanical Garden, Sumida Park and the banks of the Meguro River. When to visit: Cherry flowers start blooming in Tokyo by late March to early April, but the dates vary every year. After hitting full bloom, the flowers stay for about a week before falling off. For the perfect 'cherry on top': Potter along Chidorigafuchi in the evening when the trees are lit, giving the pink-hued promenade an ethereal spectre. Come spring, a walk along the Eiffel Tower gets all the more romantic with blooming cherry trees enveloping the area in pink hues. Parc du Champ de Mars, located between the Eiffel Tower and École Militaire, is a must-visit place in Paris to witness blossoming sakura. You can get the best view at the corner of Avenue Gustave Eiffel and Allée Adrienne Lecouvreur. The south façade of Notre-Dame de Paris is one of the most well-known cherry blossom viewing spots in the city, but if you’re looking for a quaint spot to get drenched in pink-petal rain, head to Square Gabriel Pierné or the central courtyard of the Petit Palais. Jardin des Plantes has the city’s most diverse selection of cherry blossoms. Further afield, Disneyland Paris and Parc de Sceaux call for a trip to see the pink and white displays. When to visit: The blossom season in Paris starts from late March to mid-April. Some of the trees in Jardin des Plantes bloom till late April. For the perfect 'cherry on top': Don’t miss the white-petal ‘Snow White’ or ‘Mount Fuji’ cherry blossom tree at Jardin des Plantes – yes, not all sakura come in pink. After you’ve explored all the blooming spots in Paris, how about getting a taste of Parisian food? Check out our suggestions of the best eateries in the city. With almost 40,000 cherry trees spread across the city, it’s easy to see why Vancouver in British Columbia (Canada) is a favourite cherry blossom holiday destination. The entire city morphs into a picture postcard in pretty pink, giving you the perfect opportunity to spread a blanket and enjoy picnic under a blooming cherry tree. For best views, visit the picturesque Queen Elizabeth Park where blossoms continue for around two months. Stanley Park and VanDusen Botanical Garden have rows of blossoming trees. But if you’re looking for bursts of pink and white in downtown, head to Waterfront, Burrard Skytrain station, Granville Island or Yew Street in Kitsilano neighbourhood. The annual Vancouver Cherry Blossom Festival welcomes spring with art performances, film screenings, haiku competition, spring lights illumination and jam concert. When to visit: The flowers bloom in intervals starting from early March through late April, so early to mid-April is the best time to plan a visit. For the perfect 'cherry on top': Visit Sakura Days Japan Fair at VanDusen Botanical Garden that hosts tea ceremonies, sake tasting, geisha dances, Japanese food stalls and much more. Amid the towering skyscrapers of the Big Apple, cherry flowers bloom in full glory ushering new beginnings. One of New York’s must-visit destinations for gazing at cherry blossoms, Brooklyn Botanic Garden features 42 varieties of cherry trees that transform the garden into a pink-splashed canopy. When the wind blows, the confetti-like blossoms float all around and fall off like snowflakes. You can also spot the delicate blooms at Roosevelt Island where the Manhattan skyline acts as the perfect backdrop. Cherry blossoms add a dash of colour to the verdant Central Park too, particularly on the east side of the Loeb Boathouse, Conservatory Water, Bethesda Terrace and the Reservoir. Randalls Island Park and Riverside Park are two other prominent blossom venues in New York. When to visit: Plan your visit anytime from late March or early April to mid-May to catch a glimpse of the blooms. For the perfect 'cherry on top': Check out the Sakura Matsuri cherry blossom festival at the Brooklyn Botanic Garden that celebrates Japanese culture with a Japanese tea room, a flea market and an art gallery. It is usually held during the last weekend in April. If you’re looking for a holiday to the Big Apple without breaking the bank, we’ve got the best of things to do in New York on a budget. Each spring, Jerte Valley in Spain – located north of the Extremaduran province of Cáceres – is draped in a sweeping white blanket of faux snow. It’s actually blooming white cherry flowers that give this rolling valley a winter wonderland look. Featuring over 2 million cherry trees, the 70-km-long Jerte Valley is among Spain’s most spectacular regions during spring and produces some of the best sweet cherries in the world. To celebrate cherry blossom, the valley hosts the week-long La Fiesta del Cerezo en Flor during late March to early April every year, where you can find exhibitions, live cooking workshops, tasting sessions, musical performances, guided tours, nature walks and other activities. A good way to explore Jerte Valley is to drive through the 11 towns constituting the valley. When to visit: The blooming begins by late March or early April and stays for another 2 weeks. The fruit harvesting kicks off by May. For the perfect 'cherry on top': Enjoy sporty fun at Jerte Valley, which is a great destination for sports enthusiasts and offers quad biking, horse riding, hiking, paragliding and more. Got a few more days in your hand? Take an amazing Game of Thrones tour of sun-splashed Spain to explore the various magnificent corners of the country. Kersenbloesempark in Amsterdamse Bos, between Amsterdam and Amstelveen, doesn’t usually feature in travel itineraries for most parts of the year. But during spring, this tranquil park decks out in pastel pink and white shades drawing visitors from near and far. There are 400 cherry trees in the park, which were planted by the Japan Women’s Club in 2000 as a tribute to Tsunami victims. Of these, 200 trees have female Dutch names and the rest bear female Japanese names. The park hosts its annual cherry blossom festival, or hanami matsuri, where you can savour traditional Japanese food and drinks in tents or simply enjoy a picnic under the flowering trees. You can also spend a relaxing afternoon admiring fluffy sakura clouds at Westerpark in Amsterdam West. When to visit: Cherry flowers start blooming between early and mid-April in Amsterdam, which coincides with the hanami matsuri festival. For the perfect 'cherry on top': Explore the floral spectacle of Amsterdam further by visiting the Keukenhof Gardens that comes alive with 800 varieties of blossoming tulips, from late March to mid-May. Stockholm isn’t one of those places you’d expect to see cherry blossoms, but the flowers find a way to make their presence felt even in the most unexpected place. The open plaza in Kungsträdgården (King's Tree Garden) at the city centre is framed by pale pink blooms hanging from 65 Japanese cherry trees that makes it an ideal spot for picnic or leisurely stroll. Dating back to the Middle Ages, Kungsträdgården is the oldest and one of the most popular parks of Stockholm. It’s a favourite among locals and tourists not just for the floral spectre, but also hosts numerous events, including open-air concerts, exhibitions, food festivals and street theatre. You can find a number of outdoor cafés and restaurants close to the garden. When to visit: Spring kicks off a bit slow in Stockholm, so the blossoms start appearing from mid- to late April. For the perfect 'cherry on top': Revel in festivities at the annual cherry blossom festival that takes place at Kungsträdgården in mid-April. There are cultural workshops, stage shows, dance performances and food stalls.